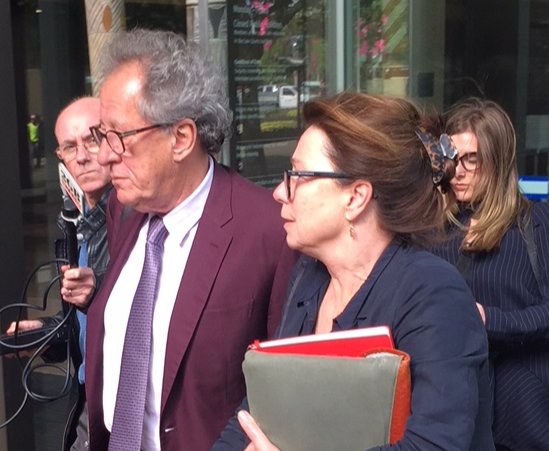 The Daily Telegraph set out to deliberately hurt Geoffrey Rush to the extent the actor may never work again, his barrister has told the Federal Court. As the three-week defamation trial closed, Bruce McClintock SC, again castigated the News Corp tabloid and its journalist Jonathon Moran for “calculated cruelty”. McClintock also said there was a wider problem with Australian journalism with publications that “take sides” and “make judgments”. It also emerged for the first time that Rush is seeking “millions of dollars” from Telegraph publisher Nationwide News as the Pirates of the Caribbean star seeks aggravated damages in addition to economic losses. The veteran actor sued the paper over allegations he engaged in “inappropriate behaviour” during a Sydney Theatre Company production of King Lear in 2015/16. Rush claimed the stories portrayed him as a “pervert” and “sexual predator”. McClintock, addressing the issue of aggravated damages in the event of Rush being vindicated, said the Telegraph’s stories were “inherently and intrinsically malicious” that were designed to “hurt Mr Rush and smash his name and career”. The Telegraph had “disabled him from working”, with the actor being “heckled” during performances among his fears. Furthermore, the risk remains that offers of work will dry up, with even a “taint” enough to deter Hollywood, McClintock said. The damage to his reputation has been “absolutely enormous”, while the hurt to his feelings has been “immense”, he said. The stories and approach by the Telegraph was “unfair, sensationalist and extravagant”, McClintock added. Responding, Tom Blackburn SC, representing Telegraph publisher Nationwide News and Moran, told the court there was no evidence to suggest the “millions of dollars being claimed” should be awarded. There had been nothing to suggest Rush was “medically, emotionally or any in way unable to work”, he told Justice Wigney. Blackburn argued that evidence from Rush’s agent Fred Specktor, who told the court he was “not fielding” offers for Rush, did not mean offers of work had stopped. Justice Wigney suggested that was a “fine distinction”. General damages in defamation cases in Australia is set at $398,500 although that does not apply to special or aggravated damages which are being claimed by Rush. Justice Wigney said he would “dearly love” to issue a judgment before the end of the year but, because of his schedule “that’s not going to happen”. He told the court he hopes to make a ruling “within a reasonable space of time early next year”.